Prost learned how to win races with unreliable Renault from 1981-1983, but it was losing to McLaren team-mate Niki Lauda in 1984 that taught him that you also needed guile to win a title. Back-to-back crowns followed. But it was Prost's battles with Ayrton Senna, who joined McLaren in 1988, that defined his career. Their relationship hit rock bottom at Suzuka in 1989, where a collision between the two gave Prost to take his third world title. A year later, with Prost now at Ferrari, it happened again, this time with Senna clinching the crown. 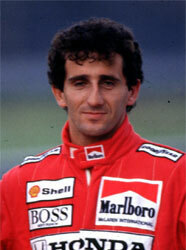 After falling out with Ferrari, Prost took a year out before returning for one more year with Williams in 1993. Needless to say, he won the title. Should Alain Prost be higher or lower in F1's greatest drivers?